An unusual stone was recently on sale at a Chinese art exhibition. 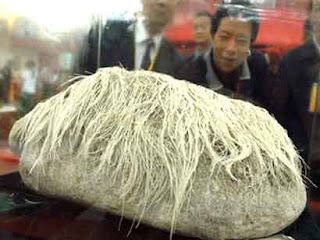 Priced at well over a million dollars, the foot-long stone is covered with strands of white hair. Exhibition staff believe the "hair" may actually be the remains of a bizarre fungus. But your guess is probably as good as theirs. You know the dance and song "Japanorama" post? This is the original one. that stone has a (Cruella Devil accent) FABULOUS hair do. Very interesting video from Japan. The style of dance is called "Para Para" (http://en.wikipedia.org/wiki/Para_Para). It's a solo dance that's meant to be ultra girly.